Ultra short-throw presentation display for interactive SMART Boards. Compatible with SMART Board M680 and 880 interactive whiteboards, the PowerLite 680 ultra short-throw XGA presentation display for SMART supports the SMART Extended Control Panel1 and features advanced network connectivity. Pair it with a SMART Board (sold separately) featuring SMART Learning Suite tools for an integrated solution. 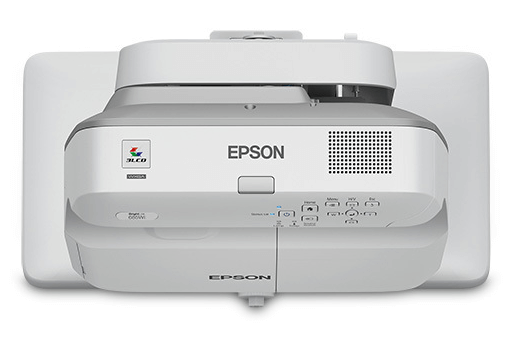 Offering up to 3x Higher Color Brightness than competitive models, Epson® 3LCD projectors and displays ensure vivid lessons. Delivering 3,500 lumens of color and white brightness, the 680 projects a 77" image from less than 7". Easy network connectivity and included software allow remote management and presentation. Plus, its lamp lasts up to 10,000 hours in ECO Mode. Project large 77" images from a short distance. Ideal for use with interactive whiteboards or standard whiteboards. Minimizes shadow interference and glare.